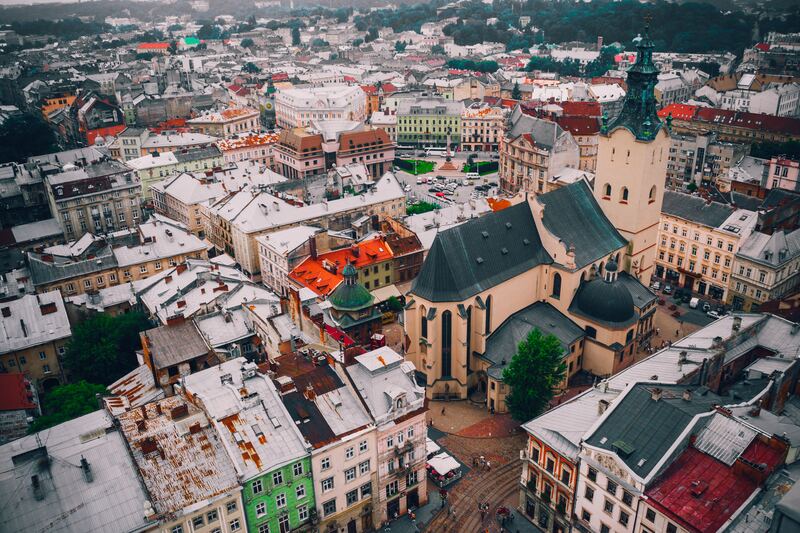 Lovely Lviv in from above. When I first visited Lviv in 2016, one of my highest priorities was to learn the Ukrainian language. Although Lviv is the best city in Ukraine to learn Ukrainian (in other cities Russian or Surzhyk, a mix of Russian and Ukrainian, is the dominant language), there are actually not that many options in the city for learning Ukrainian. This has to do with the fact that there’s typically not enough demand to fill up Ukrainian language courses. That said, there are options for learning Ukrainian in the city, and my intention with this post is to list those options for you so you don’t have to run around tracking them for yourself. The University of Lviv, also known as Ivan Franko University (after the esteemed nationalist poet), offers a year-long Ukrainian course for foreign students who wish to study for a degree taught in Ukrainian language at the university. The program is very cheap (around 36,000 hryvnia, or $1,500 USD) , and I’ve met many foreigners from places like South America and Africa who now speak fluent Ukrainian after completing this program and studying towards a degree in a Ukrainian language, so it seems to provide at least a good foundation in the language. One upside of being in the program is that you do get to study in the beautiful main building of the University of Lviv by Ivan Franko park, but the downside is that the course is taught by older professors who follow a very old-fashioned mode of instruction (lots of classroom work and recitation). Ukrainian Catholic University is quite simply one of the best universities in Ukraine, with world-class teaching in a variety of subjects. It is not afflicted with the plague of corruption that affects other Ukrainian universities. They have a long-running and well-established Ukrainian language course that is attended annually by many heritage Ukrainian speakers. The course runs June through July, with rolling admissions beginning every Monday. Recently, they have added a course for the spring time that starts in May as well. The course is highly regarded, and offers many cultural excursions. Do note that the course may be a little bit insular because it attracts young (high-school aged) diaspora Ukrainians from the U.S. and Canada. The course is also quite expensive, especially by Ukrainian standards. Solomija Buk, a philology professor at the University of Lviv, has been running her own private Ukrainian language school called “The Ukrainian Language and Culture School” for a few years now. It was actually her program that I used when I first came to Lviv and started learning Ukrainian. I signed up for an intensive three-week course in Ukrainian and was put in a class with one other student, and then moved to private one-on-one lessons for 9 euros an hour (about $10 USD). The problem with Solomija’s school is that there are so few other students, that it doesn’t support formal classes, just private one-on-one lessons. My friend Michael actually took a one-on-one courses with Solomija and gave her rave reviews. My experience with my own teacher was mixed. I learned a lot from her, especially because it was a one-on-one course, but you could tell that she lacked teacher training, and she had a difficult time making the lessons interesting. In any case, if you are looking for a reasonable option for one-on-one instruction Solomija’s school is a good option. It’s possible to find a cheap and enthusiastic private tutor in Ukrainian language very easily if you don’t mind doing a bit of footwork. When my Chilean friend Juan Pablo came to Lviv, he went straight to the University of Lviv and put up a flyer that basically said: “I’m looking for a student who’s willing to teach me Ukrainian language.” He got a number of offers and ended up settling on one by an English-speaking international relations student who he paid $3 an hour for private lessons. Although she wasn’t trained as a teacher, he did learn a lot simply by fact of speaking with her so much every lesson. I actually ended up hiring her as a tutor and conversation partner when I felt like I needed more guided practice with my Ukrainian, and it worked out really well for everyone involved. Keep in mind that wages for students are very low in this country and $3 an hour is a very good rate for most students, so you can help someone out as you’re learning Ukrainian! All of the options I’ve listed above have their pluses and minuses. If you want classroom instruction, I would say just take the language course at the University of Lviv just because it’s so cheap. If you are looking for one-on-one instruction, I think talking to students at the University of Lviv is probably your best bet, but you have to be willing to put in a bit of work in posting a flyer at the university campus. Let us know in the comments below if you are aware of any other options for learning Ukrainian in Lviv!